What Held Christ to the Cross? As I was prayerfully reflecting on my planned posting for today, which was to be on St. Catherine of Genoa and Purgatory, my prayer slowly drifted from St. Catherine and Purgatory to Christ Crucified and the question of “What held Christ to the cross?” At first, I dismissed the question as a diversion. However, the question persisted. Then I dismissed the question as has having the obvious answer of: Christ was nailed to the cross. Therefore, it was the nails that pierced his hands and feet that held Christ to the cross. In the back of mind I could hear the verse, “save yourself! If you are the Son of God, come down from the cross” (Matthew 27:40) juxtaposed with “This is my beloved Son, with whom I am well pleased” (Matthew 3:17). Jesus is the Son of God. He could have come down from the cross at any time. But, He did not. He held Himself to cross. It was His love for His Father that held Him to the cross. It was His redeeming love for us that held Him to the cross. So great is the love of Son for the Father, His Bride, the Church, and us! Not only did Jesus lay Himself down to be nailed to the cross. It was He, and not the nails that pierced His body, that held Him to the cross for those long agonizing hours. 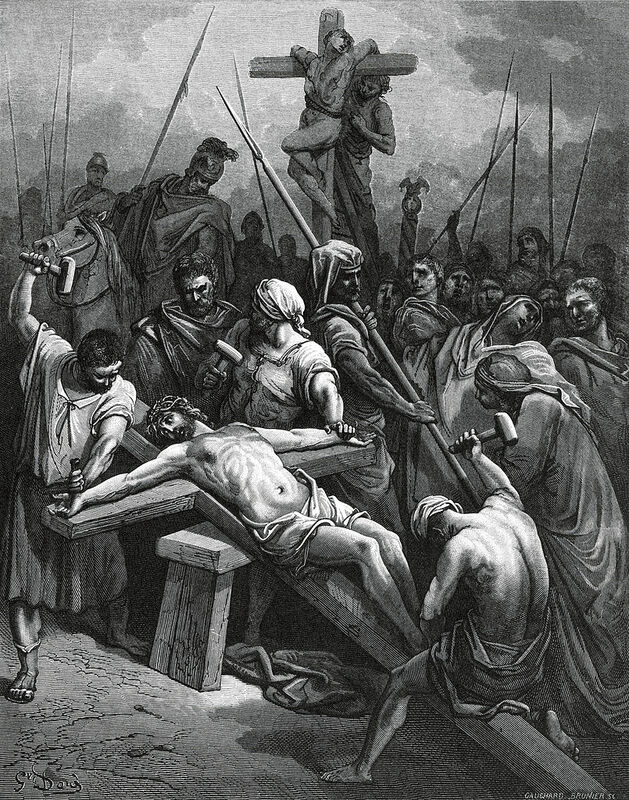 This entry was posted in Essays, Meditations On Biblical Verses, Uncategorized and tagged Beloved Son, Catholic, Catholicism, Christ Crucified, Christian., Christianity, Matthew 27:40, Matthew 3:17, Nailed to the Cross. Bookmark the permalink.